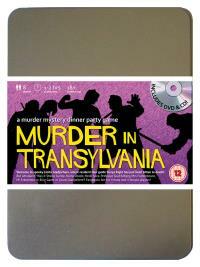 You've been invited to play the role of ELLIE GANTT in Murder in Transylvania. Who killed Sonya Right? Welcome to Castle Gladjorhere, home of the world’s one and only Transvampire with a soul! Visitors from all walks of life have come to witness the thrills and chills of this genuine Transylvanian house of horror, all of which will be revealed by the resident tour guide Sonya Right. But shortly after dinner Sonya is found in her room with two small puncture wounds in her neck. Join us to find out who sucked the life out of her! International catwalk model (she’s purr-fect!) Costume Suggestion : You wear the latest couture fashion - a long black dress revealing to the sides with matching high heels. Essentials are always carried with you, including a hairbrush, lipstick, and a vanity mirror. You strike a pose at every opportunity. You’re sure you need no introduction – as a world-famous international catwalk model, your face graces the covers of magazines and 60-foot billboards everywhere. Because of this, you have to be obsessive about your appearance, which is why you’ve brought five suitcases, four full length mirrors, three gallons of moisturiser, two hairdressers and a sensory deprivation tank, for when you need to get away from it all.